&COPY; 2019 Prep Network. All rights reserved. Prep Network announced it most recent hire, Carleton College graduate Kevin Grow. Kevin joins the team as the Web & Data Analyst. In this role, Kevin will oversee all data across all aspects of the business to help the company make better decisions. This includes building strategies to grow existing revenue streams, as well as developing new revenue opportunities. Kevin will work closely with our web team to update and improve all Prep Network web properties. This includes SEO optimization, regular updates, and some programming. 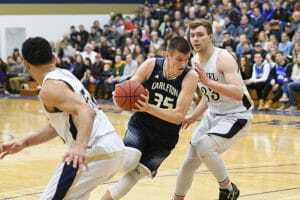 Kevin graduated from Carleton in 2018 as the most decorated basketball player in Knight history, finishing his career with over 1,000 points and 1,000 rebounds. After his senior season, he was named an All-American honorable mention by D3Hoops.com as well as an All-MIAC First Team selection, (third time in career), MIAC All-Defensive Team (third time in career), NABC All-West District Team (second time in career), All-West Region Team (second time in career) and Jostens Trophy finalist. He currently lives in the north suburbs of the Twin Cities.